In one of Melbourne’s most keenly anticipated opera events of the year, the wait to hear Australia’s own Jessica Pratt in La Traviata has been well worth it. Originating in 1992, Henning Brockhaus’ concept is visually striking and richly symbolic. 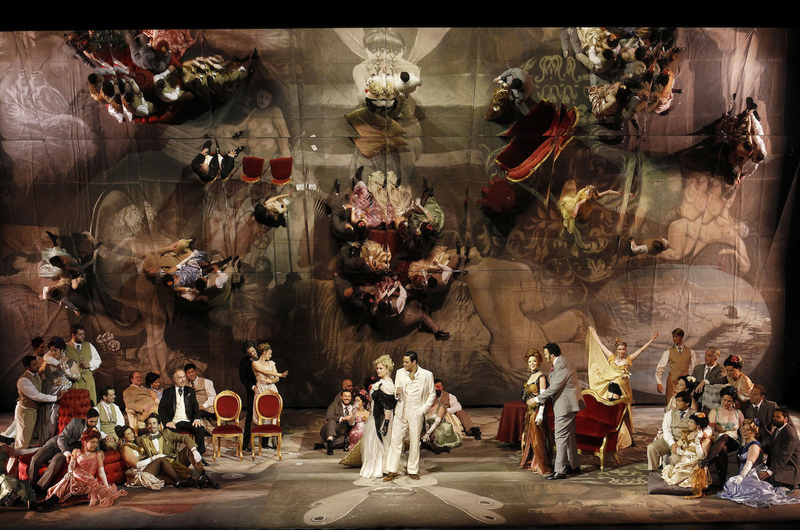 Originally designed by Josef Svoboda, the staging utilises a giant rear/overhead tilted mirror, showing us every intimate detail of the decadent lifestyles portrayed on stage. The master touch in the design is the positioning of full sized painted canvases on the floor. These are reflected into place where backdrops would usually hang, but with a shimmering, surreal splendour that could not be achieved with regular scenery.The designer for this adaptation is Benito Leonori. With a more literal approach to the setting and context of the story than is often taken, Brockhaus ensures that the salacious, sexual lives of the characters are clearly conveyed. Rather than her frequent portrayal as the toast of society, Violetta is shown unmistakably as a prostitute in a salon of women who are there for the entertainment and pleasure of men. The lively opening sees chorus members and dancers cavorting in a debauched evening of indulgence. From the moment she first opens her mouth to sing, Jessica Pratt makes it clear why we are all here. Pouring forth like liquid gold, Pratt’s natural, effortless soprano has the audience entranced with its beauty and dexterity. Each of Violetta’s moods and styles are no problem for Pratt; from soaring cadenzas to breathless pianissimo, she has the audience’s rapt attention at all times. While Pratt may appear a little healthy to be a dying consumptive, she is suitably pasty and disheveled at the end; meanwhile, her buxom beauty makes her popularity as a courtesan clear. 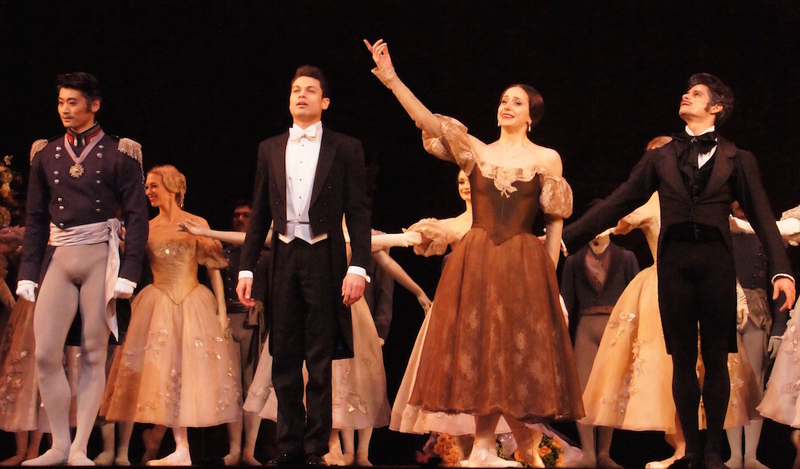 Pratt particularly impresses in Violetta’s big act one tour de force sequence of “É strano,” “Ah! Fors’è lui” and Sempre libera,” earning a rousing, extended ovation at the end of the act. The way her voice exquisitely caresses the phrases in “Ah! fors’è lui” is sublime. Pratt, and indeed the whole company, benefit from performing in Her Majesty’s Theatre, a far more intimate venue that the Opera Australia’s home at the State Theatre. The chance to hear opera sounding so wonderful at The Maj is as much a reason to attend this season as any of the attractions of performers and production. An excellent use of the giant mirror comes at the top of act two. Living the carefree life of unfettered love, Alfredo lies on his back singing “De’ miei bolenti spiriti” while the mirror shows him floating overhead, facing us as he sings. Changing his entire body language and vocal expression, visting Italian tenor Alessandro Scotto di Luisi conveys the sharp turn of feeling between this aria and the next, after Alfredo learns that Violetta is selling possessions to support their lifestyle. On opening night, Scotto di Luisi visibly lost his nerve at the end of “O mio rimorso,” singing the final note down the octave and leaving the stage in a bit if an embarrassed rush. Still, the handsome young tenor regained composure for his subsequent scenes, and gave a promising performance overall. Usually known for playing comic roles that benefit from his sparkling smile and twinkling eyes, José Carbó is a revelation in the darkly dramatic role of Giorgio Germont. A little too short to convey the character’s imposing nature, Carbó lets his voice do all the work to brilliant effect. 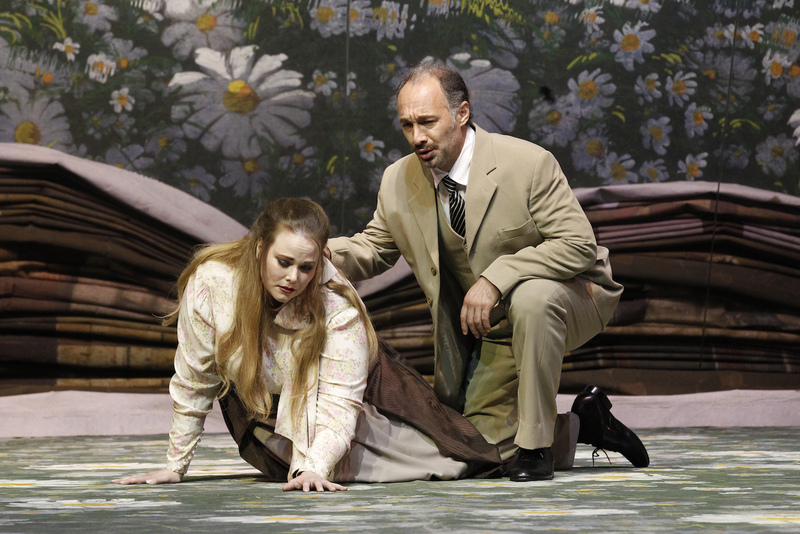 Giorgio’s two main arias are supported by changes in the carpet backdrops. As “Pura siccome un angelo’ begins, the image of the country house peels back to reveal a charming field of daisies. It peels again for “Di Provenza il mar” to reveal a collage of vintage family portraits. Carbó expertly balances the brutal and compassionate sides of Giorgio, and is in tremendous voice throughout. There is a great impact at the opening of the curtain for act two, scene two, in which we find the cast glittering in black and dark red, gambling at tables in Flora’s gilt edged salon. Gypsies and matadors are cleverly presented as actual adult entertainment, wearing titillating costumes. 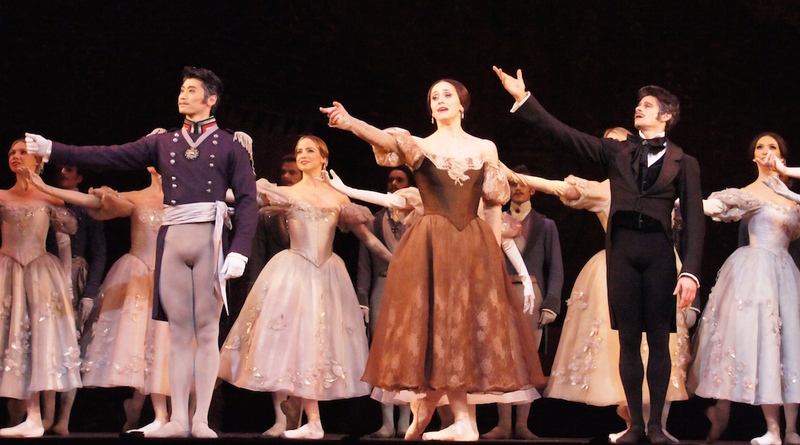 The roles are performed by real dancers, who are excellent, while the chorus sings. Society men availing themselves of the pleasures of Flora’s salon camp it up in feather boas. In a neat piece of choreography, the full company’s dance spirals in on itself then reveals the arrival of Alfredo. Choreography is by Valentina Escobar, who also serves as assistant director. Pratt, as Violetta, has the best of Giancarlo Colis’ costumes, with her stunning black dress for Flora’s salon the best of these. Some of the men’s suits seem to be from a more recent period than this production’s setting. In another odd but presumably deliberate choice, Violetta’s servants Annina and Giuseppe are dressed rather casually, as if they are her acquaintances rather than her employees. Excellent use is made of Victorian Opera’s current and recent Young Artists, who are quickly building up impressive performance experience. Standouts are Jeremy Kleeman as the fey Marchese d’Obigny and Nathan Lay, virtually unrecognisable as Baron Douphol. The opportunity to hear first-rate baritone Lay in a larger featured role cannot come soon enough. Dimity Shepherd is reliably wonderful as Flora, dazzling with her glamorous appearance and beautiful voice. The performance of Pratt, whose stature and fame in the opera world are rising exponentially at present, is certainly not one that any Melbourne operagoer should miss. 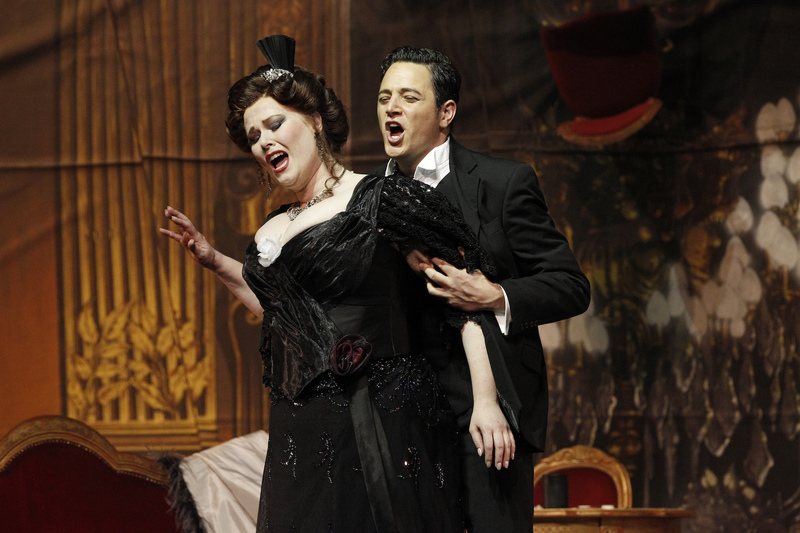 La Traviata plays at Her Majesty’s Theatre, Melbourne until 29 May 2014. Lovely review, but I need to query: why the comments about Jose Carbo’s height and Jessica Pratt’s non-consumptive size? In this day and age, these are choices made by management: looks over voices, or voices over looks? In writing your review in this way, you seem to want the best of both worlds…which in my opinion, very rarely exists. 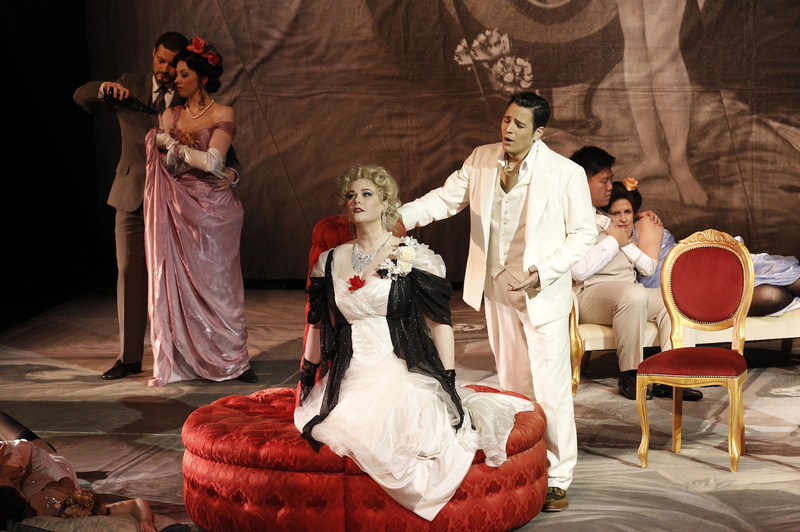 Isn’t opera about singing, emotion and music, before all else? I wish you’d make a choice, and write your reviews accordingly. If voice is more important to you than looks, please say so in the reviews. I hope the choice you’d make would be to applaud beautiful acting and truly extraordinary singing…and leave the side comments about size to gossip mags and other, less educated commentators. Thanks for your feedback Emily, very good points. When you take those comments together it does make me sound rather superficial. In regard to Jessica Pratt, I only said that she looked a bit too healthy, which was a comment about her face and hair etc during the show, not particularly about her size. My comment about about her buxom beauty was related to the fact that the production deliberately highlighted her attractively curvy shape in her costumes as a courtesan/prostitute. I debated over including the comment about Jose Carbo. It’s just that there are several moments when the character should/could appear quite imposing and I mentioned his stature as an introduction to mention that he achieved the same effect but with his voice, which was very impressive. In neither case did I mean these points in a negative way, and certainly not in any regard to these performers being cast in this or any other operas. I am thrilled has this production with these performers. I hope that you have the chance to go along (or have already seen it). I know that I would like to see it again. I was staggered (in a positive way) by the astoundingly good performance by Jessica Pratt. As good as the rest of the cast were, they had to really lift their game in the presence of Jessica. Her stylish mastery of the legato line and staggering control of the pianissimo, even as she was reclining on her side on a sofa (a very demanding request by the director), were exemplary to any serious singer. I urge all university standard sopranos not to miss this display of truly world class singing while they can. Miss this and you will have to travel far and wide to see such magnificent talent again. As for the production, I thought it colourful, clever and thought provoking, easy on the eyes and unobtrusive, but there was at times far too much movement for the sake of it, especially in act three as poor, sick Violetta lurches, falls, staggers and slumps all around the stage. It was far too distracting fom the absolute focus necessary for the performance almost demanded by Verdi’s score. When directors realise that the real genius is the composer then we may actually get productions that amplify the meaning and don’t distract us from it. Even though ‘La Traviata’ has been performed countless hundreds or thousands of times, I believe the true drama lies more in the score and the story and less in the stage action. This is a time to rely on the tried and tested saying ‘less is more’. Thanks so much for this comment Lucas. I totally agree with your thoughts about Ms Pratt. She was so good that, at times, you had to pinch yourself, so to speak, so as to remind yourself not to just take her performance for granted. 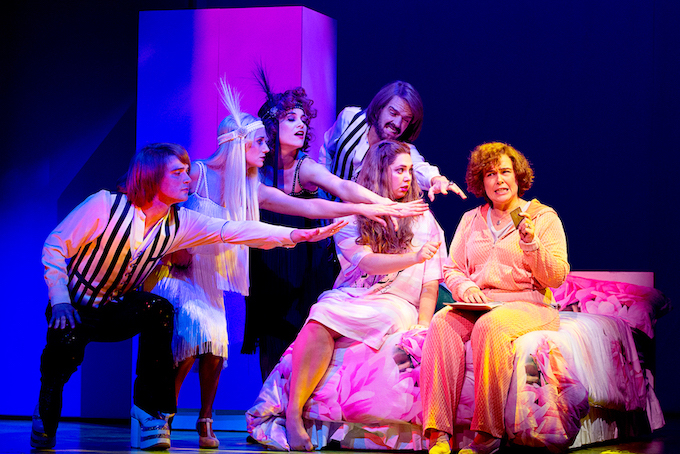 There was a perfectly good bed on stage for act three, so why Violetta moved about so much was beyond me. Did you happen to read the director’s note in the program? I don’t think the production quite matched his description/build up, particularly the mention of Brechtian devices. Over the past three years I have seen La Traviata in Melbourne, Sydney, New York, London, Vienna, Munich and Milan. My gold standard, believe it or not, is the Sydney Harbour version, which, although far from intimate, was blessed with wonderful acting and direction, not to mention singing. (Even though we had to hear the music through speakers, the sound reproduction, thankfully, was pristine). Do you have a personal favourite? Thanks for this lovely review. We thoroughly enjoyed the production, and marveled at the sets. Jessica Pratt’s voice was divine. And we agreed Nathan Lay was a standout. We are very much looking forward to hearing more from this young baritone. Thanks so much for these comments Julie. I keep thinking that I will have to go back to see/hear the production again so I think I will have to do this. In saying that I cannot wait to hear Nathan Lay in a larger role, I perhaps should have mentioned that he already gave a wonderful performance as Guglielmo in Melbourne Opera’s Cosi Fan Tutte. Here’s to his next big role!